ickens seems to have welcomed with relief his relative anonymity when in 1842 he visited Montreal, Lower Canada's chief city both politically and economically, which had a population of 44,000. His name might have been a household word among the officers and ladies of the British garrison but certainly not among the majority of Montrealers. Having the mother country's leading novelist among them must have certainly have been thrilling for officers yearning to be in England again in the spring of 1842; as Morley remarks, "Something akin to nostalgia could be observed in the dramatic efforts of the English officers" (41) who were members of the Garrison Amateurs, a homesickness evident in the plays they chose, "pieces . . . of the well-worn kind, . . . gone over again and again in the bills of the average English theatre of that time" (41). Despite a brief visit to Quebec City, Charles Dickens spent most of the two weeks following his 11 May 1842 arrival in Montreal drilling a platoon of Garrison Amateurs for a series of plays to be presented to a private audience on Wednesday, 25 May, and to a larger, public audience on Saturday, 28 May. Immediately after the Garrison Players' theatricals, the Theatre Royal commenced its public season, opening with Milman's Fazio on 30 May. According to Morley and the various biographers, Dickens "had been eagerly looking forward" to taking Vincent Crummles' role of actor-manager "while visiting the cities and townships of the United States earlier in the year" (39), the penultimate stage before sailing home. 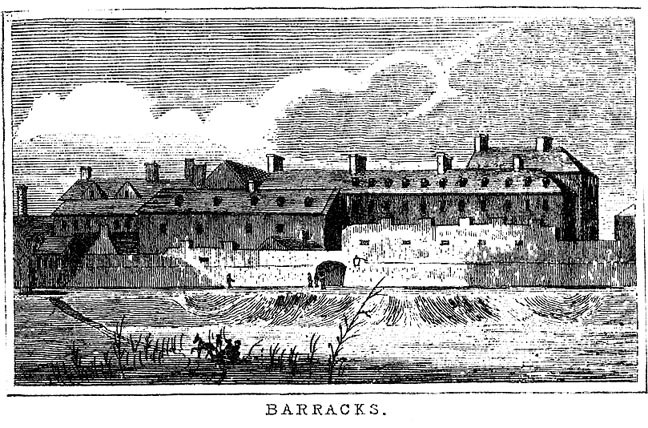 Left: The Barracks where theatricals were performed. Right: Queen's Theatre. 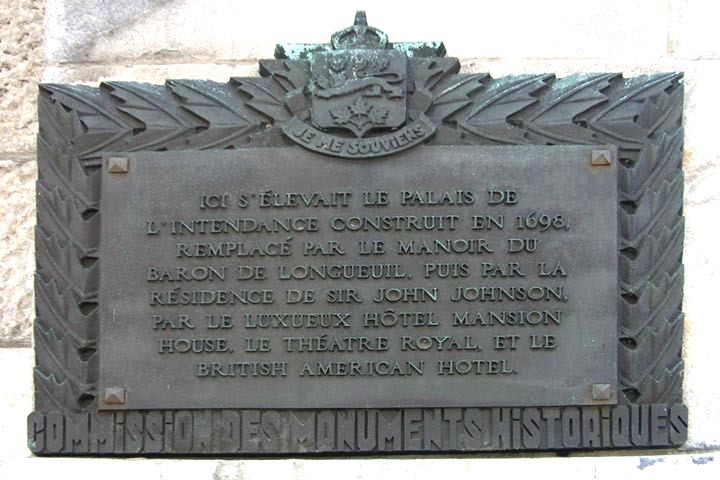 Even before the construction of Montreal's first theatre 1804, theatrical presentations in the English language were staged by the officers of the occupying British Garrison, who indeed had their own theatre. 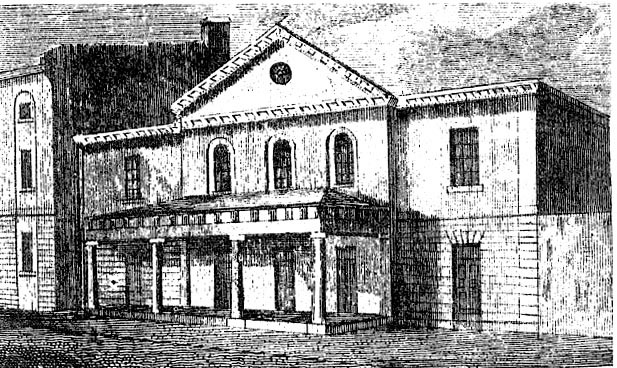 Although built in 1825 at the corner of St. Paul and Victor Streets in the Old Town area by local brewer and business magnate John Molson Senior, by the time of the Dickenses' visit the Theatre Royal was referred to as the Queen's Theatre when such non-professional groups as the English Amateurs, the Gentlemen Canadian Amateurs, the Scotch [sic] Amateurs, and the City Amateurs were staging their private theatricals there. With a plain exterior and a neoclassical porch, it had cost the brewer $30,000 to build, and seated approximately 1,500 in a pit, gallery, and two tiers of boxes. Opening with Frederick Reynold's The Dramatist on 21 November 1825, it had initially been home to a 71-member repertory company that catered to a somewhat conservative theatrical taste by staging Shakespeare plays, Regency tragedies and domestic plays by popular Irish dramatist James Sheridan Knowles (1784-1862), late-eighteenth-century comedies by Mrs. Hannah Cowley (1743-1809), and Georgian social comedies by Richard Brinsley Sheridan (1751-1816). Local acting companies, including amateurs associated with the garrison, took over after the original management under the financially inept Frederick Brown, the self-styled "Liverpool Roscius," went bankrupt in 1826. After a succession of managers, Henry Tuthill, noted for comic Irish parts, was the lessee in 1842 when Dickens and his wife took to the boards that had already been trodden by the tragedians Edmund and Charles Kean, Charles Kemble, and Edwin Forrest, and one of Dickens's favourite living comedians, J. B. Buckstone. Others who appeared behind the Theatre Royal's footlights included the original of Nicholas Nickleby's Infant Phenomenon (Jean Davenport, 1839), the Dublin tragic actor Thomas L. Ternan and his wife, Fanny Jarman (1836), whose daughter Ellen would figure so prominently in the hidden life of an older Charles Dickens. Most modern readers must surely wonder at a French colonial city's supporting an English-language theatre and bringing to town so many notable thespians in the early nineteenth century; in fact, according to The Canadian Encyclopedia, during the middle third of the century, English-speakers were in the majority, the result of considerable British emigration after the ultimate defeat of Napoleon in 1815. An energetic, primarily Scottish merchant class created the Bank of Montreal in 1817 and the Committee of Trade in 1822, and began the construction of railways in 1836. At the time of the construction of the Theatre Royal, the population numbered 22,591; by the time of Dickens's visit, that number had increased to 44,000--of whom some 12,000 were members of the British garrison and their dependants. Hence, there was definitely a strong consumer-base for an exclusively English-language theatrical venue capable of seating 1,500. Although the regular season for the Theatre Royal's company in the 1840s was, despite Montreal's well known humidity, late spring and summer, the troupe would go on tour briefly, visiting nearby communities, in particular "The Gibraltar of the North," the citadel of Quebec, the officers of its garrison undoubtedly being avid theatre patrons. According to Morley, after an 1844 season that included the great English tragedian William Macready, a member of Dickens's most intimate circle, the theatre mounted a final production, The Comedy of Errors. The theatre closed on 8 August 1844, to be demolished and replaced by the silver-domed landmark designed by noted British architect William Footner, the Bonsecours Market (1846), which briefly served as Canada's Parliament Buildings in 1849 when Montreal was the capital of Upper and Lower Canada. The architecturally impressive, block-long Bonsecours Market still occupies the site today at 330 Saint-Paul Est; all that remains of the city's first professional theatre is a plaque on one corner of the market, where the theatre stood for nineteen years. The street named for the visiting author has fared no better, for Dickens Lane at the side of Francisco Rasco's Hotel opposite (where the Dickenses stayed for 19 days) disappeared in 1999 to make way for a large-scale condominium project. On the hotel was a plaque commemorating Dickens's visit to Montreal, but it, too, together with items of Dickens memorabilia, has been swallowed by the sands of time. Baszczynski, Marilyn. "Theatre Royal." The Canadian Encyclopedia, ed. James H. Marsh. Edmonton: Hurtig, 1988. Vol. 4, p. 2149. Hustak, Alan. Exploring Old Montreal: An Opinionated Guide to its Streets, Churches, and Historic Landmarks. Montreal: Vehicule Press, 2005. Linteau, Paul-Andre. "Montreal." The Canadian Encyclopedia, ed. James H. Marsh. Edmonton: Hurtig, 1988. Vol. 3, p. 1379-1383. Morley, Malcolm. "Theatre Royal, Montreal." Dickensian 45 (1949): 39-44.